Over the past few decades, the world has witnessed a tremendous increase in the number of higher education institutions accompanied by an upsurge in student enrolment and tuition fees. Changes have been rapid, global and dramatic but merely quantitative. Vital to this far-reaching upheaval has been the intermingling of universities with the free market. Indeed, with the withdrawal of government funding, and having been abandoned to the mercy of management teams, universities have become unprecedentedly more difficult to distinguish from business enterprises. As a matter of course, higher education is no more conceived as a public good in which societies should invest, nor is it perceived as the cultural powerhouse it once was. Nevertheless, its transformation has not come to an end and entails many discussions – discussions that continue to occupy the forefronts of all stakeholders involved, from students and faculty members to policy makers and university governments. Despite all the discussing, nothing is certain except the uncertainty of what awaits higher education. 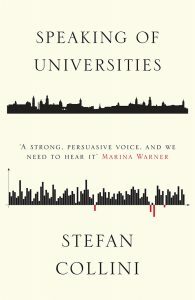 Stefan Collini’s 2017 book Speaking of Universities addresses this problematic in its critique of the fast paced transformation of the university and its impacts. The book is a self-declared continuation of another, What are Universities for?, published in 2012 (4). Much of it brings together a collection of talks, lectures and articles, in addition to an appendix of short pieces previously published in newspapers. Delivered and written in such settings from Melbourne to Lisbon to Edinburgh to Pittsburgh, Collini’s writings do more than simply cover the contemporary peculiarities of higher education in England, of which he is a native, and brave the vast territories of higher education in the world, exposing it for the global industry it has largely become (246). Collini first sets out to elucidate the terms and premises integral to the paradigm shift in higher education, which he then proceeds to examine in its manifold expressions. To this purpose, he identifies a dialectical relationship between societal changes and the ongoing remaking of universities (36). Universities undoubtedly change as societies change – as do all social institutions; notwithstanding, throughout his writings Collini exercises due diligence not to explicate this dynamic by resorting to reductionist accounts that mistake social imaginaries of neoliberal ideology as its sole determinant (ibid.). Instead, implicit to his analyses is the inquiry of a more complex process whereby he factors in diverse variables of influence as well as the opportunities and challenges presented by historically significant turns of events (37). These include globalizing market patterns, digital advancements and ever widening range of subjects that can be studied to acquire a higher education degree (2). It is, nonetheless, no coincidence that the beginnings of this transformation intersect with the withering away of aristocratic and social democratic notions once dominant in university settings (230). From 1980s onwards market-centred values have taken precedence to reshape universities in their own image. While the overall transformation of universities may have not come to realization as a simple matter of design, the radical remaking of the funding system has been the deliberate doing of a hegemonic offensive and produced only predictable results (2, 242). Along with other market-oriented initiatives such as the encouragement of ‘private providers’, it has subordinated universities to the currently favoured forms of economic policy (205). These developments have recast higher education as a commodity, a ‘commercial transaction’ between the applicant and the university (2, 259-60). Teaching higher education is today more dependent on income-contingent loans and overseas student fees as never before; consequently, universities have become vendors serving broad cultural education to the children of the relatively wealthy (33, 34). As for research universities, deepening austerity policies and cuts have implied turning to large conglomerates of capital willing to commission and pay for projects (21); this has amounted, in return, not only to a greater degree of market influence on their internal policies, but also to new questions about transparency and independence of scientific research (34, 146-7). Concomitant to these changes have been alterations in the forms of higher education governments (1-2). Managerialism, Collini explains, has replaced traditional administration as the new executive structure, at the apex of which is a ‘senior management team’ implementing top-down directives (21, 46, 205). This new form of government has prioritized procedures, values and interests of business managers over the original purposes of the university (45-6); the university at the disposal of managers signals a discontinuation of deference to the ideals of ‘culture’ while simultaneously dispossessing the faculty of its collective power and status (230). Not surprisingly, managerialism mainly plays the accountability that society legitimately demands into the hands of rather mechanical manifestations of this demand (205). To add insult to injury, while the rule of managers is all about external shows of accountability, managerialism itself stands an impediment to the much desired ‘true democratic accountability’ which is indispensable to fulfilling the university’s rationale to the best of their capacity (ibid.). Certain kinds of interdisciplinarity, Collini remarks, have also reinforced, albeit indirectly, this undemocratic mode of accountability (226, 228). By encouraging the homogenization of distinct disciplines, they have in some cases concluded in the ‘abolition of departments or their supersession by larger units’ run by the stewardship of managerialism, which further stripped the tenured faculty of academic autonomy and its role in decision-making processes (29). These executive reconfigurations have been in part an outcome of the fashionable intent of our times to mimic the most reputable institutions in the United States without possessing an adequate knowledge of these institutions. In reality, a foremost characteristic of successful American universities is the robust culture of departments; as Collini contends, it is these departments, which maintain inherited standards and protocols of scholarship, and their relative dominance that militate in favour of the prestige of these world-renowned universities (ibid.). At stake with universities, as far as managerialism is concerned, are economic incentives, commercial profit, academic output and client satisfaction; from this stems the treatment of universities as ‘businesses’, academics as ‘operatives’, students as ‘consumers’, and public as ‘taxpayers’ (155-76, 209, 243). This being the case, regulations accordingly adopted do not fall far from those effected by the agents of market forces in other aspects of society (205, 230). As might be expected, they reflect management’s pursuit of contributing economic benefit to market in a given time (227). One particular result of this has been the overwhelming presence of such quasi-bureaucratic corporate procedures as funding, assessment, ‘quality control’ and ‘impact’ which, Collini recalls, were entirely unknown to academics only three decades ago and now take most of their working time (1). Dictating social forces have, so far, lessened the social contribution of scholarly research. Moreover, so many scholars have readily internalized the language of market individualism (227-8). This has been evident in the usual cacophony of complicity and complacency, if not also in the widespread silence of defeat and despair, to the extent of culminating in preposterous idolizations of contrived models, e.g., the so-called system of higher education in the US where there is no one system of higher education and where there exists, in fact, a plethora of complex and diverse educational regimes (28-9, 45-6). Amid all this degeneration, on the other hand, students are far too busy trying to earn their degrees and land a job thereafter, and when they, though seldom, mobilize against tuition hikes the consumerist fallacy propagates, it takes only some committee of managers round a table to dismiss their demands as youthful hyperbole (33, 259-61, 282-7). There stands, however, no empowered body whatsoever to step in when the same managers’ market favouritism puts the immense value universities hold to humankind in imminent danger, such that immediate contravention is irremissible from an intellectual and moral standpoint (242-3). Essential to Collini’s outlook is the firm conviction that the university is an indivisible part of the human heritage. It is beyond the ownership of any one party, whether be it governments, citizenry, staff or students (232, 244). For generations of a complex intellectual inheritance cannot be reduced to rather crude terms of property rights (231-43). Confining its contribution in predetermined boundaries of time and space is a fatal flaw, as is any attempt at quantifying this contribution by economic indicators (45, 242-3, 271). The extent, quality and impact of intellectual work are, to the contrary, impaired by the market-centred standards of quality control. In fact, the fetishized forms of measurement have only facilitated severing universities from their universal human content and effectively barred them from reflexive questioning, a quality tacit to scientific production (57, 87, 242). Once deprived of this critical feature, the university, though it may bear the same name, will certainly, if incrementally, become altogether a different institution. In view of such reasoning, Collini advances the noble cause against the complete metamorphosis of universities into mere enterprises instrumental to economic growth at the expense of their actual worth and purpose (86-8, 116-7). This constitutes the very basis of Collini’s argumentation against the present arrangements regulating funding, governance and assessment limiting the illimitable task of ‘extending and deepening human understanding’, a task that by its nature requires generations of sustained praxis at a world-wide scale (271). The narrow-minded philistinism of managerialism is, therefore, exactly the opposite of what the university needs to fulfil its primary role, and so are the frustrating political measures of market-fundamentalist orthodoxy (28-30, 45-6). Hence, Collini commends pluralist government forms of good administration and lauds the Scottish model, where prime responsibility of funding higher education still remains with the national state (45, 179-92, 209). All the aforementioned considered, Speaking of Universities conveys a clear message of dissidence that is much needed in the face of the gloomy future universities are seemingly headed for (11, 33). This dissension takes on an even greater significance at a time when those agreeing with Collini self-admittedly find it too risky to echo his voice in their own universities (8-10). Collini’s fundamental criticism thus breaks this very defeatist silence, but by the same token it shuns systemic approval and limitations thereof. In this sense, and by not agreeably engaging the reigning opinion, the book accomplishes its stated mission and, as the timely incitement it is, helps pave the way for a better informed intervention in the current course of affairs.